When the Nintendo Wii was first released, I noticed that plenty of people took up gaming enthusiastically, and this newfound enthusiasm can be seen in how they actually make use of the Wii remote. The level of immersion within the game is truly high even without the help of high definition graphics, and this is made possible thanks to the quality gameplay of certain Wii titles (perhaps Sony could take a page out of Nintendo’s book in this aspect). Unfortunately, there is a downside to this level of interest shown by gamers when they play the Wii, as the amount of strength the gamer actually puts in flailing the Wii remote around is rather surprising. That can be proven by the amount of TV sets that have been “stabbed” by a wayward, flying Wii remote due to overzealous swinging and (perhaps) a weak strap. This brilliant idea of a Safety Shield for the TV has long been overdue, and I could not be more delighted to see it ready for a mass commercial launch. Made by Taiwanese TV accessories manufacturer LCDArms, the Safety Shield offers your lovely new widescreen flat panel display the protection it deserves, considering the amount of money you saved over the past few months to acquire one. The Safety Shield comes in different sizes that suit 30″ screens up to 46″ models, so those with displays not within that range are out of luck. 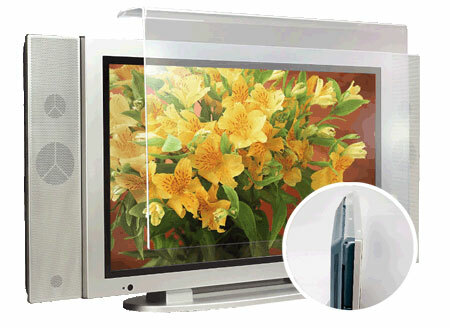 Features include light transmissive rate of more than 98%, ensuring you do not suffer from any noticeable image quality loss, an invisible frame to maintain living room aesthetics, and the ability to reduce UV rays emitted from your TV screen, resulting in better health for your eyes. There is no word on pricing or availability for the Safety Shield, but it definitely ought to come compulsory with each Wii purchase.